Henshaw, Luther, head-of-household, age 32, born in Pennsylvania; parents born in Pennsylvania; first marriage, married 7 years; occupation: farmer, general farm; rented farm. 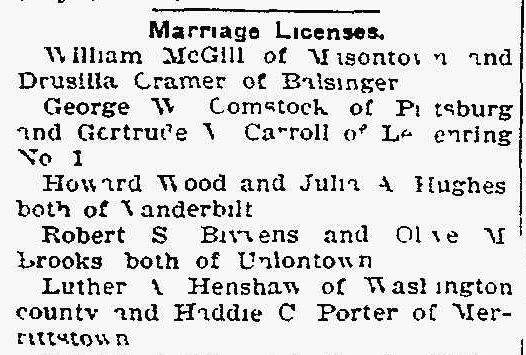 Henshaw, Haddie, wife, age 32, born in Pennsylvania; parents born in Pennsylvania; first marriage, married 7 years; 3 children, 3 living. Henshaw, Ruth I., daughter, age 6, born in Pennsylvania; parents born in Pennsylvania. Henshaw, Anna A., daughter, age 3, born in Pennsylvania; parents born in Pennsylvania. Henshaw, Mary E., daughter, age 7 months, born in Pennsylvania; parents born in Pennsylvania. Bane, Jessie, servant, age 17, born in Pennsylvania; parents born in Pennsylvania; single; occupation: works out, housework. Henshaw, Luther A., head-of-household, age 42, born in Pennsylvania; parents born in Pennsylvania; owned home; occupation: farmer. 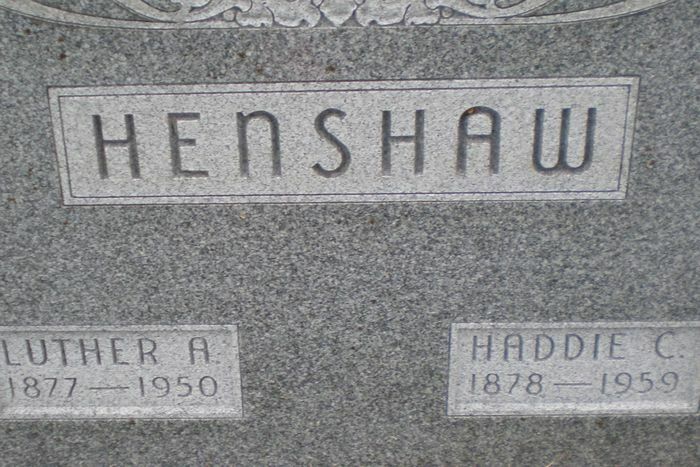 Henshaw, Haddie C., wife, age 41, born in Pennsylvania; parents born in Pennsylvania. Henshaw, Ruth I., daughter, age 16, born in Pennsylvania; parents born in Pennsylvania; attended school. Henshaw, Anna A., daughter, age 12, born in Pennsylvania; parents born in Pennsylvania; attended school. Henshaw, Mary E., daughter, age 10, born in Pennsylvania; parents born in Pennsylvania; attended school. Henshaw, Helen E., daughter, age 8, born in Ohio; parents born in Pennsylvania. Henshaw, John N., son, age 4 years 2 months, born in Ohio; parents born in Pennsylvania. Henshaw, William S., son, age 2, born in Ohio; parents born in Pennsylvania. Henshaw, Luther A., head-of-household, age 52, born in Pennsylvania; parents born in Pennsylvania; first married at age 24; owned home; occupation: farmer, general farm. Henshaw, Hattie, wife, age 52, born in Pennsylvania; parents born in Pennsylvania; first married at age 24. Henshaw, Hellen E., daughter, age 18, born in Ohio; parents born in Pennsylvania. Henshaw, John M., son, age 14, born in Ohio; parents born in Pennsylvania; attended school. Henshaw, William S., son, age 12, born in Ohio; parents born in Pennsylvania; attended school. Henshaw, Luther, head-of-household, age 62, born in Pennsylvania; completed 8th grade; on Apr 1 1935 was living in the same house; owned farm ($2000 value); occupation: owner, farm. 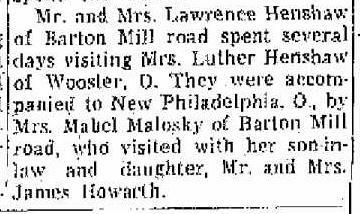 Henshaw, Hattie, wife, age 62, born in Pennsylvania; completed 2 years of high school; on Apr 1 1935 was living in the same house. Henshaw, John N., son, age 24, born in Ohio; completed 2 years of college; on Apr 1 1935 was living in the same house; single; attended school. Henshaw, William, son, age 22, born in Ohio; completed 2 years of college; on Apr 1 1935 was living in the same house; single; attended school. Luther Alvin Henshaw died May 27 19502,4,12, Fayette County, Pennsylvania2,4,12 [Mount Vernon, Knox County, Ohio7]; buried Wayne Presbyterian Church Cemetery, State Rt. 83, Wooster, Wayne County, Ohio2,4,12. 1910 census, West Bethlehem Township, Washington County, Pennsylvania; roll T624-1427, ED 252, page #5A, line #10, dwelling #93, family #95. 1920 census, Wayne Township, Wayne County, Ohio; roll T625-1448, ED 214, page #5A, line #1, dwelling #81, family #82.
data principally from a Porter genealogy manuscript prepared in 1934 by Charles J. Stewart & Eleanor Dunaway. 1930 census, Wayne Township, Wayne County, Ohio; roll T626-1888, ED 37, page #13A, line #42, dwelling #414, family #415. 1940 census, Wayne Township, Wayne County, Ohio; roll T627-3168, ED 85-49, page #17A, line #10, household #319. 1880 census, North Union Township, Fayette County, Pennsylvania; roll T9-1130, ED 48, page 351C, line #12, dwelling #152, family #171. 1900 census, North Union Township, Fayette County, Pennsylvania; roll T623-1411, ED 48, page 1A, line #22, dwelling #4, family #5. Ancestry Family Tree data "Federer Veedmont Family Tree" posted by "Reme12492". Obituary of Anna M. Henshaw. Ohio Obituary Index, 1830s-2011, Rutherford B. Hayes Presidential Center; http://www.ancestry.com. "The Courier", Jul 25 1902; http://www.ancestry.com. "The Morning Herald", Jun 1 1950; http://www.ancestry.com. "The Morning Herald", Jul 24 1950; http://www.ancestry.com.